We just finished our 3rd annual Hacking for Defense class at Stanford. Six teams presented their Lessons Learned presentations. Watching them I was left with wonder and awe about what they accomplished in 10 weeks. Six teams spoke to over 600 beneficiaries, stakeholders, requirements writers, program managers, warfighters, legal, security, customers, etc. By the end the class all of the teams realized that the problem as given by the sponsor had morphed into something bigger, deeper and much more interesting. Each of the six teams presented a 2-minute video to provide context about their problem and then gave an 8-minute presentation of their Lessons Learned over the 10-weeks. Each of their slide presentations follow their customer discovery journey. 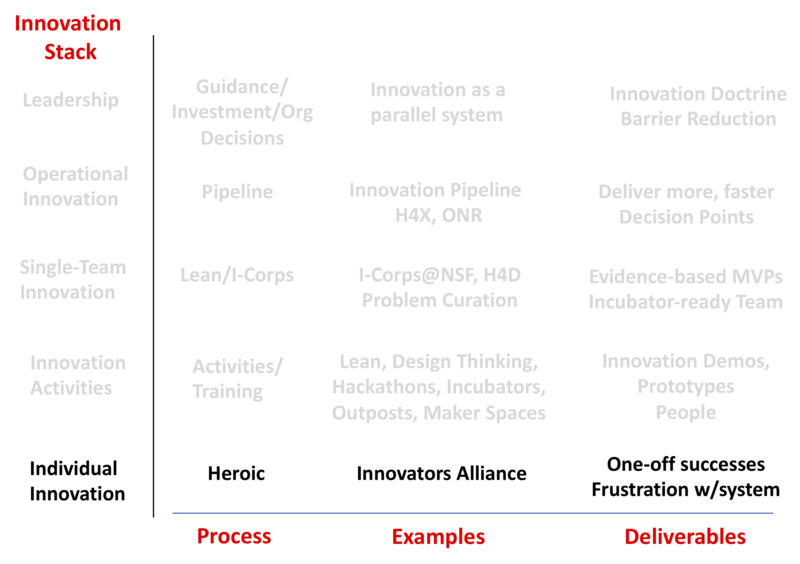 All the teams used the Mission Model Canvas, Customer Development and Agile Engineering to build Minimal Viable Products, but all of their journeys were unique. Video of the teams live presentation are here. Worth your time to watch. Note: The Hacking for Defense class was designed as “fundamental research” to be shared broadly and the results are not subject to restriction for proprietary or national security reasons. In the 10 weeks the students have, Hacking for Defense hardware and software prototypes don’t advance beyond a Technology Readiness Level 4 and remain outside the scope of US export control regulations and restrictions on foreign national participation. 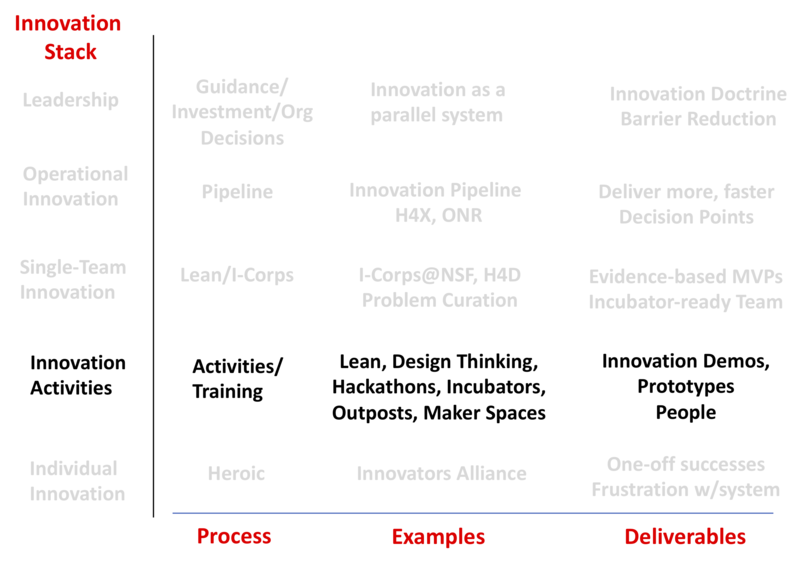 Our primary goal was to teach students Lean Innovation while they engaged in a national public service. Today if college students want to give back to their country they think of Teach for America, the Peace Corps, or Americorps or perhaps the US Digital Service or the GSA’s 18F. Few consider opportunities to make the world safer with the Department of Defense, Intelligence Community or other government agencies. Next, we wanted the students to learn about the nation’s threats and security challenges while working with innovators inside the DoD and Intelligence Community. While doing so, also teach our sponsors (the innovators inside the Department of Defense (DOD) and Intelligence Community (IC)) that there is a methodology that can help them understand and better respond to rapidly evolving asymmetric threats. 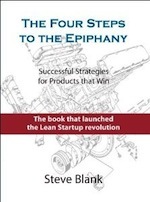 That if we could get teams to rapidly discover the real problems in the field using Lean methods, and only then articulate the requirements to solve them, could defense acquisition programs operate at speed and urgency and deliver timely and needed solutions. Finally, we wanted to familiarize students about the military as a profession, its expertise, and its proper role in society. And conversely show our sponsors in the Department of Defense and Intelligence community that civilian students can make a meaningful contribution to problem understanding and rapid prototyping of solutions to real-world problems. 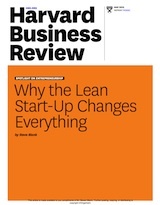 Hacking for Defense has its origins in the Lean LaunchPad class I first taught at Stanford in 2011. It was adopted by the National Science Foundation in 2012 to train Principal Investigators who wanted to get a federal grant for commercializing their science (an SBIR grant.) 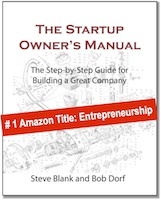 The NSF observed, “The class is the scientific method for entrepreneurship. 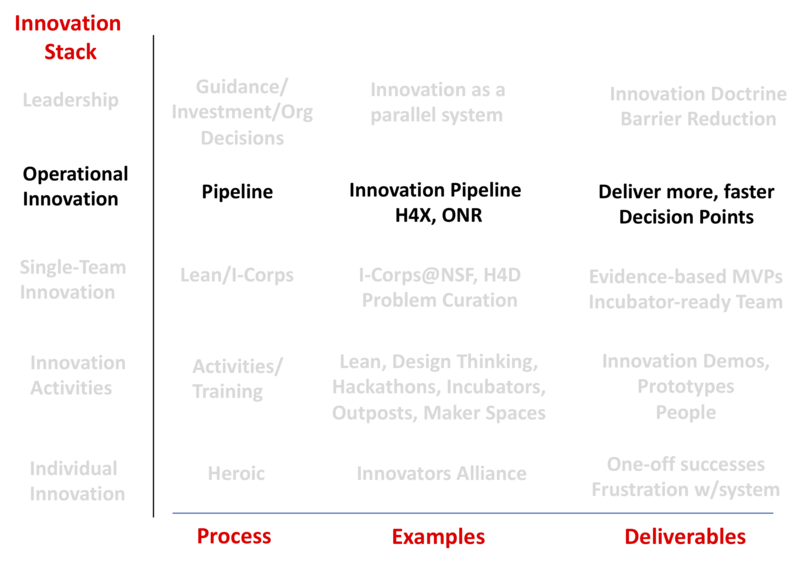 Scientists understand hypothesis testing” and relabeled the class as the NSF I-Corps (Innovation Corps). The class is now taught in 81 universities and has trained over 1500 science teams. It was adopted by the National Institutes of Health as I-Corps at NIH in 2014 and at the National Security Agency in 2015. In 2016, brainstorming with Pete Newell of BMNT and Joe Felter at Stanford we observed that students in our research universities had little connection to the problems their government as well as the larger issues civil society was grappling with. 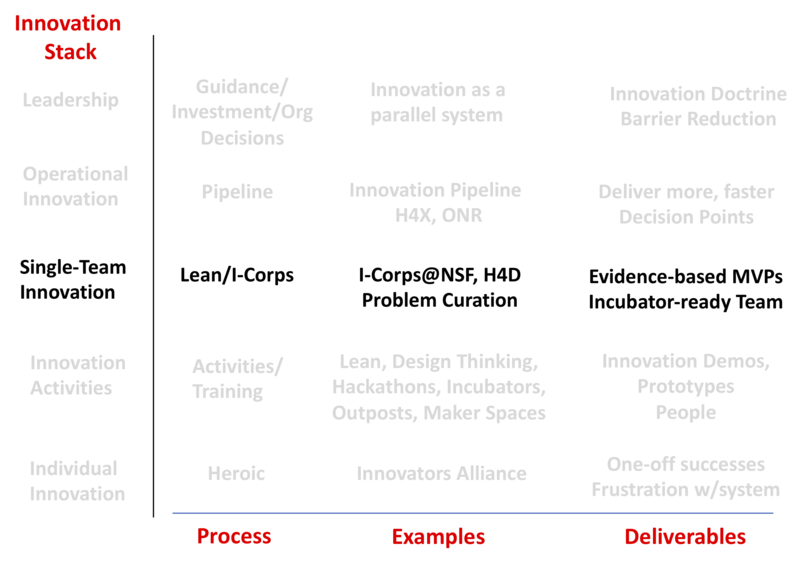 Wondering how we could get students engaged, we realized the same Lean LaunchPad/I-Corps class would provide a framework to do so. Both Hacking for Defense and Hacking for Diplomacy with the State Department were born. Hacking for Energy at Columbia, Hacking for Impact (Non-Profits) at Berkeley and Hacking for Conservation and Development at Duke quickly followed. Hacking for Defense is now offered at eleven universities in addition to Stanford – Georgetown, University of Pittsburgh, Boise State, UC San Diego, James Madison University, University of Southern Mississippi, University of Southern California and Columbia University. Over the next year it will expand to 22 universities. 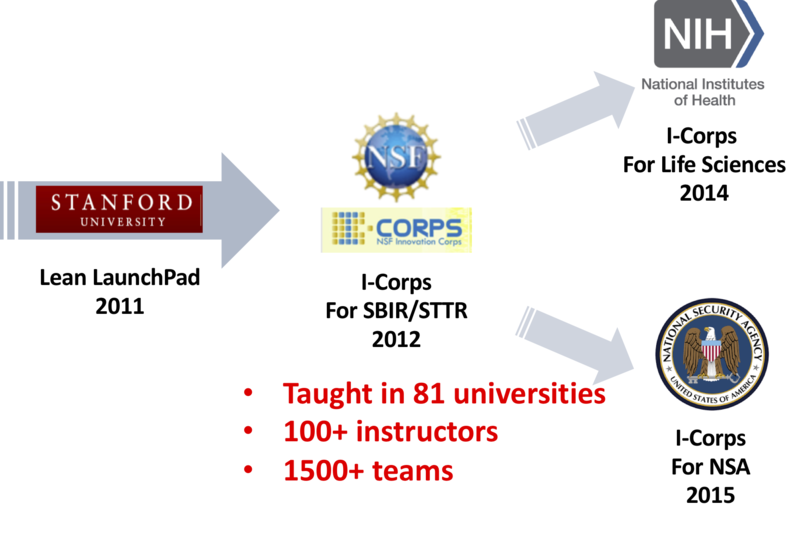 Hacking for Defense.org a non-profit, was established to train educators and to provide a single point of contact for connecting the DOD/IC sponsor problems to these universities. Pete Newell is a retired Army Colonel currently a Senior Visiting Research Fellow at the National Defense University’s Center for Technology and National Security Policy and CEO of BMNT. Jeff Decker is a social science researcher at Stanford. Jeff served in the U.S. Army as a special operations light infantry squad leader in Iraq and Afghanistan. Two of our teaching assistants were prior students: Samuel Jackson our lead TA, and Will Papper and Annie Shiel and Paricha Duangtaweesub also assisted. Special thanks to our course advisors – Tom Byers, Professor of Engineering and Faculty Director, STVP, Arun Majumdar and Sally Benson Co-directors of the Stanford Precourt Energy Institute, and John Mitchell, Stanford Provost of Teaching and Learning. A special thanks to Rich Carlin and the Office of Naval Research for supporting the program at Stanford and across the country. We were lucky to get a team of mentors (VC’s and entrepreneurs) who selflessly volunteered their time to help coach the teams. Thanks to Tom Bedecarre, Kevin Ray, Daniel Bardenstein, Rafi Holtzman, Craig Seidel, Michael Chai, Lisa Wallace and Dave Gabler. We were privileged to have the support of an extraordinary all volunteer team of professional senior military officers representing all branches of service attending fellowship programs at Stanford’s Hoover Institution, and Center for International Security and Cooperation (CISAC) and Asia Pacific Research Center (APARC) at the Freeman Spogli Institute (FSI). These included: Colonel Bradley Boyd, Lieutenant Colonel James “Gumbo” Coughlin, Lieutenant Colonel Marcus Ferrara, Lieutenant Colonel Jer “Jay” Garcia, Lieutenant Commander Nick Hill, Commander Michael Nordeen, Commander Rebecca Ore, Commander Michael Schoonover, Colonel Jason “Shrek” Terry and Todd Forsman. And of course a big shout-out to our sponsors. At SOCOM, Matt Leland and Angel Zajkowski, at MITRE, Suresh Damodaran, at NAVFAC, Ben Wilcox, at the 9th ISR, Ian Eishen, at AFRL, Jeff Palumbo and Mike Rottmayer at the Defense Acquistion University, Shirley Franko and at ERDC Thomas Bozada.